I’m really committed to giving this MKMMA process an all-out effort over the next six months. To do that one of my biggest challenges will be to stay focused! So this week was all about focus. Specifically staying focused on doing all the things that were required to be done on a daily basis. And keeping that focus day by day and throughout each day all this week. I think it’s especially important for me now, because the reading hasn’t become a habit for me yet. Plus, in the past, one of the ways I self-sabotaged was by simply “forgetting”. It’s weird and amazing how I could let things — even important things– fly out of my mind! Taking a memory supplement and using tools like setting alarms in my smartphone has helped me to keep myself on track. But I also realize I need to turn up the furnace of desire to really stay focused. Fortunately I really have a strong desire to use what we’re learning in MKMMA to propel me into the next stage of my life. So my focus is sharp! 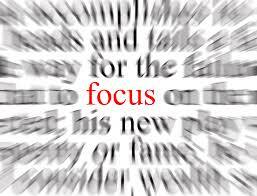 The magic of focus for me is two-fold; one it keeps me in the present moment. Secondly, specific to what we’re trying to do here, it keeps me aware of the opportunities the subby (i.e. subconscious) might be manifesting for me. For instance, one of the highlights of the week was my first physical “brush” with the focus of my DMP (Definite Major Purpose). It happened as I was browsing the internet — which can be a zoning out activity. But this time, I focused my browsing and followed a thread that lead me to some Facebook groups I didn’t know about that are specific to the target audience I want to reach. The experience gave me the “goosebumpies” as I felt the connection to my written DMP. I’ll get into more specifics around my DMP later, but for now — staying focused is helping me not miss any daily reading or weekly assignments AND create a little magic in my life! Focus is a wonderful thing! Previous Previous post: Master Key Week 1 — Hurry Up! Your Life Is Leaving!